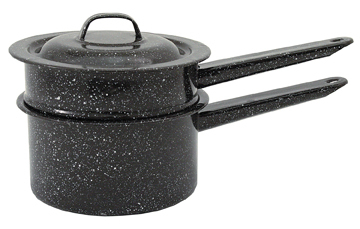 This 1.5 quart double boiler by Graniteware is constructed of low carbon steel and has a glass coating. It's steel core ensures that it heats up fast and that heat is evenly distributed throughout the boiler. No PFOA's or any other food altering chemicals are used in this boiler. Glass coating protects the boiler against rust. Why use a double boiler? A double boiler is a specialized piece of cookware for cooking delicate foods with indirect heat. The double boiler consists of two fitted saucepans. The larger saucepan is partially filled with water brought to a simmer or boil an an inner saucepan hold the food items. The heat generated from the boiling water indirectly heats the food items in the inner saucepan. This indirect cooking method is perfect for melting chocolate, and cooking custards and sauces because these delicate foods break down when exposed to direct heat.